This is a limited item of 1 pair per size in stock. Scissor Teardrop Plugs handcrafted in curly maple. Double Flare. Sizes: 12.7mm (1/2) and 14.2mm (9/16). 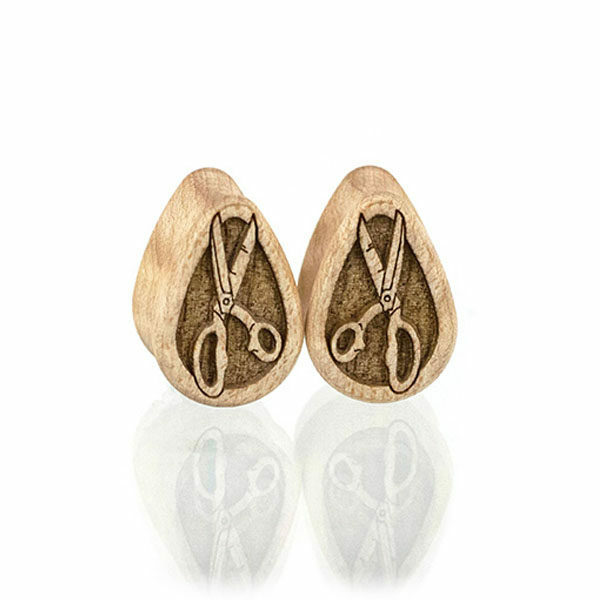 Whether you’re cutting paper, or cutting ties, do it in style with these funky scissor plugs !! Note: Wearing length measurements are taken from between flares and/or o-rings. This is NOT the overall thickness of the plug. Omerica Organic products have a tolerance of .3mm on either side of the target plug size.